November 25, 2013 /3BL Media/ - Chrysler Group LLC expanded its commitment to the Michigan Council of Women in Technology (MCWT) with a $15,000 grant from The Chrysler Foundation to support undergraduates who pursue a course of study that focuses on science, technology, engineering and mathematics (STEM). The announcement of the grant was made Nov. 23 at MCWT’s eighth annual Signature Gala in Rochester, Mich. In addition to the grant, Chrysler Group was the title sponsor for MCWT’s Signature Gala, which raised $291,000 in net proceeds for programs that help inspire and grow women in technology. “While there is much more work ahead to achieve our aspiring vision of becoming the No. 1 state for women in technology, we are energized by the ongoing commitment of our supporters, partners and volunteers,” Flores added. The Michigan Council of Women in Technology strives to inspire and grow women in technology fields, with an aspirational vision to make Michigan the No. 1 state for women in technology. The organization supports Michigan’s female IT workforce, students, corporate partners, schools and the overall community with networking, learning, mentoring, and technology experiences for professionals and students. Its non-profit Foundation provides programs and funds supporting the education and orientation of young women throughout school and fostering women in various stages of their professional lives. Find more information at www.mcwt.org and connect via LinkedIn, Facebook, Twitter, and www.mcwtblog.org. The Chrysler Foundation, the charitable arm of Chrysler Group LLC, has established a proud legacy of empowering people and investing in local communities. The Chrysler Foundation focuses its support on four key areas: Education: K-12 and post-secondary education initiatives that encourage the study and pursuit of careers in business, design, science, technology, engineering, mathematics or supply-chain management; Military: support for the nation’s service members and their families in need; Multicultural / Diversity: initiatives that promote inclusion and advancement opportunities for diverse populations; and Youth Development: organizations and programs that provide mentoring and related assistance to aid youth in the transition to adulthood. 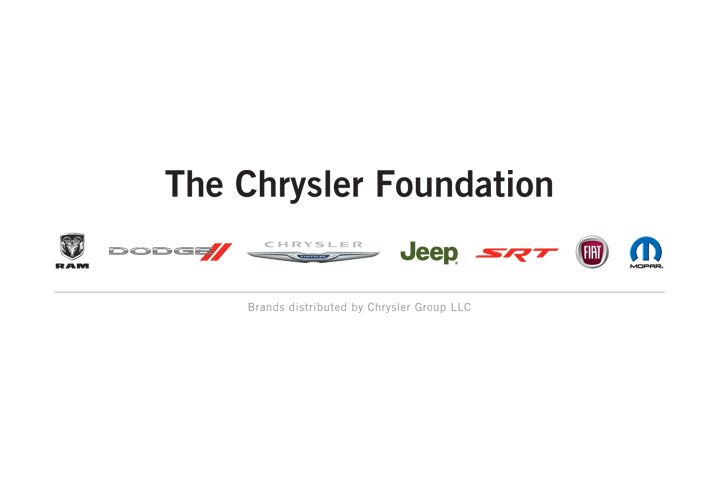 Since its inception in 1953, The Chrysler Foundation has awarded more than $500 million in charitable grants.